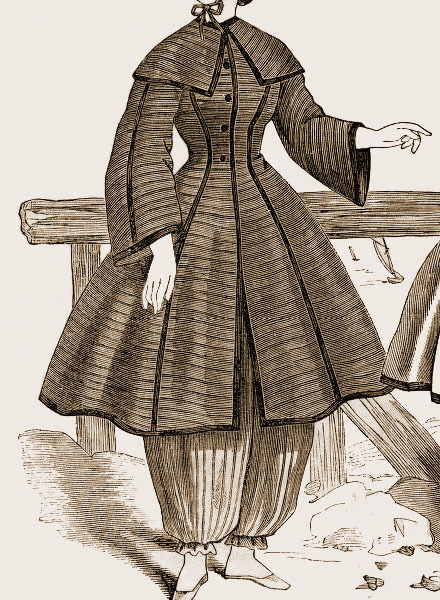 Today we have four bathing dresses, as featured in a fashion plate from July 1864. 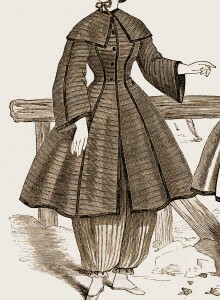 This was the height of the hoopskirt era, when dresses were full and bell-shaped. 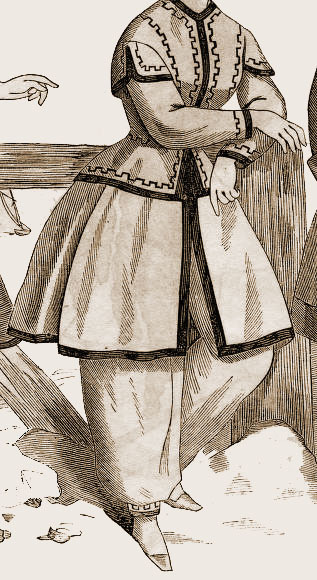 You can see the current fashion echoed in some of these bathing dresses. 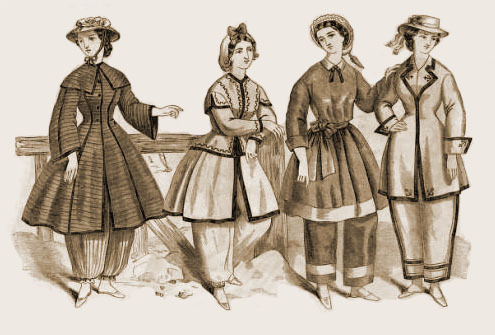 The bathing dress on the far left is two-toned and striped. The full trousers are gathered at the ankle. They are pale, with vertical stripes, while the knee-length dress is of a darker material, with princess seams and horizontal stripes. It buttons to the waist and is open below that. The sleeves are long and wide and there is a short capelet at the shoulders. The model wears a straw bonnet and flat slippers. The fashionable dress at the middle left is a lighter color, with dark binding at the edges and a geometric braid trim. The full trousers are gathered to a cuff at the ankle, which is decorated with matching braid. The dress is designed to look like a basque-style bodice and skirt and is open from the hips down. It features long coat sleeves with a short oversleeve at the shoulder. 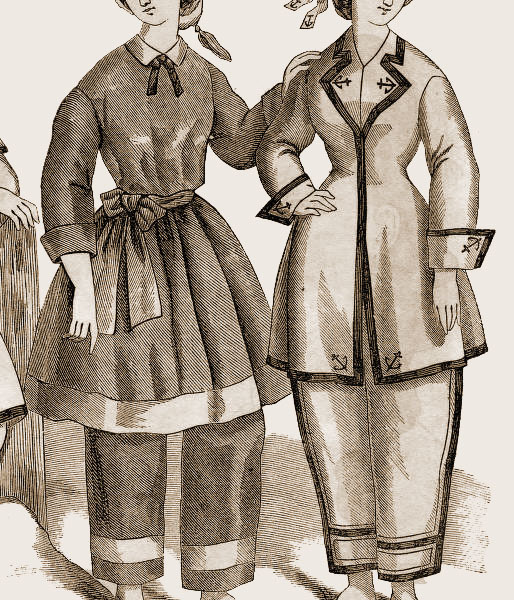 The model appears to be wearing an oilskin bathing cap to keep her hair dry, along with flat slippers. The bathing outfit at the middle right is dark with lighter bands at the hem of the dress and trousers. The trousers are straight-legged, while the top is a loose dress that’s belted at the waist. It has a high neckline with a collar and bow. The straight sleeves are rolled up. The costume to the far right is pale in color with dark edging. The trousers are tapered and banded down the sides. The dress is princess-cut with a high V-neckline and lapels. The long, straight sleeves have wide cuffs that turn back, with an anchor motif that repeats on the lapels and at the bottom corners of the dress. She wears a straw hat to finish her ensemble. What a fascinating look at what women wore to the beach in days gone by! This entry was posted in Friday's Fashion Plates and tagged Fashion Plates, Friday, Victorian. Bookmark the permalink.